Date of publication: November 17 2014 . Nature has us not indulge sunny days and good weather. Young children spend less time on the street. What parents have to do? That's right. 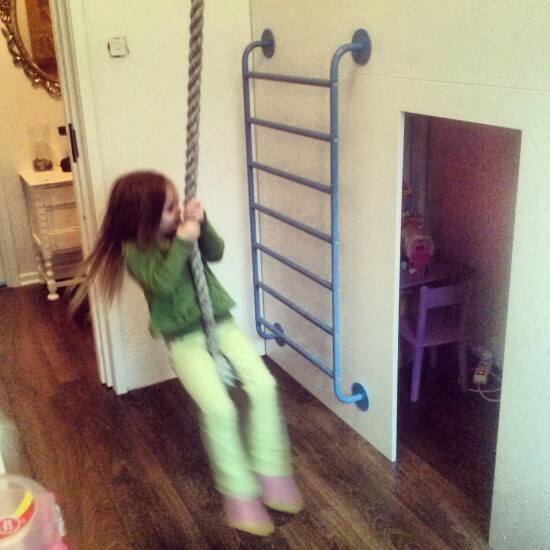 To organize leisure time of their children in the apartment walls. 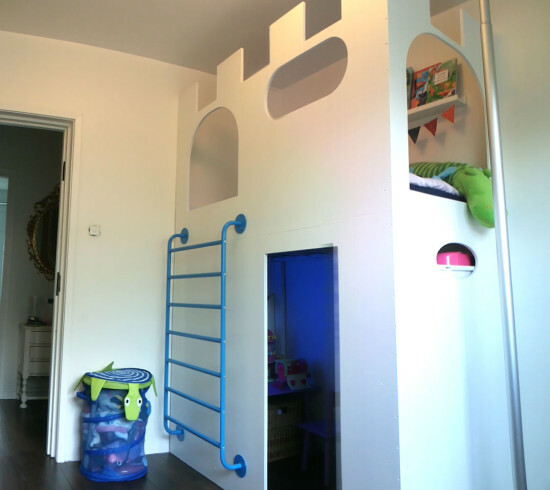 If desired, and, of course, the presence of only a few products from the IKEA catalog, easy to mediocre sleeping area turn into a real castle with sports elements. This facility is ideal for playing games and even to some extent replace the stay in the playground. And what is the little princess does not dream of his own castle ?! And any tomboy-boy will be more willing to climb the stairs or rope on the second floor of the castle. So, let's begin. Actually itself sleeping area for a child It will be located on the second floor. 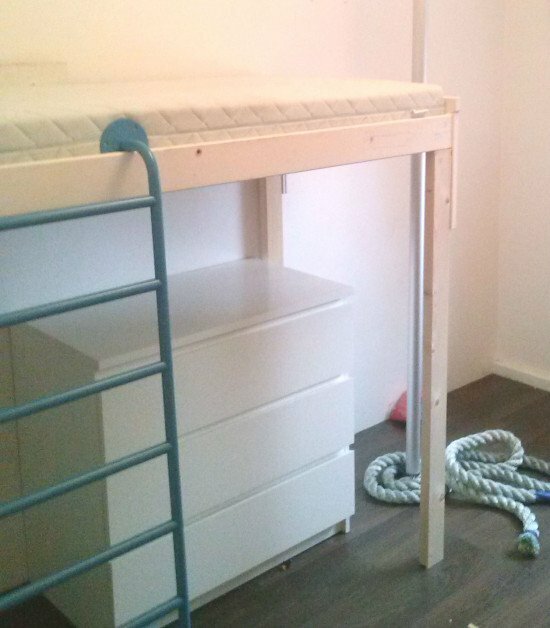 In order to build a model of the bed SNIGLAR on the upper level, replace it on the legs higher. For greater stability and therefore safety of the very bottom of the bed by means of fastening elements to fix the adjacent wall. Now it was the turn of our skin "grown up" bed 16-five millimeter MDF panels. They are derived from a natural tree, because the ideal for our children's adaptations. Before performing trim, cut it inputs and outputs, windows and other elements that are needed. All sections, again for safety use of children, it is necessary to sand, paint to cover all the panels and can proceed directly to the process of plating. This bed in a studio apartment It helps save the territorial space. 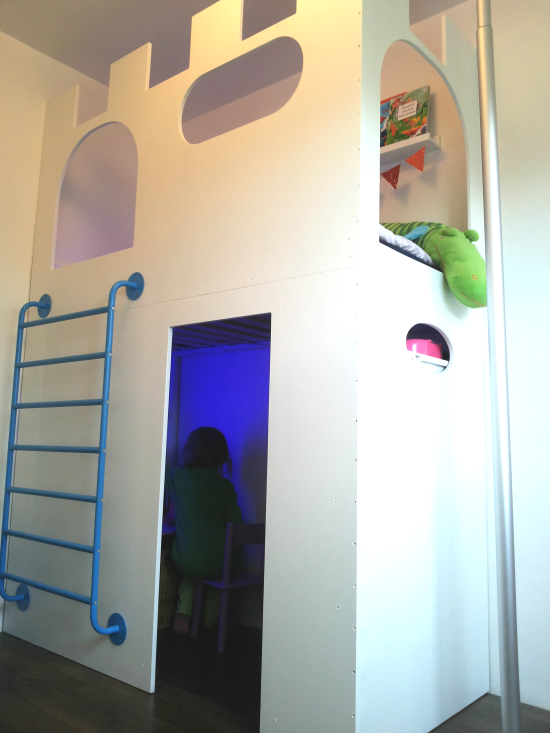 After all, on the ground floor can be build with the help of IKEA furniture and accessories personal little corner for a small child. For example, on shelves Ribby post favorite books, put the combination table-chair. It only remains to add sports items as ladders and racks STOLMEN. Interior lighting organize with the help of LED-backlight. 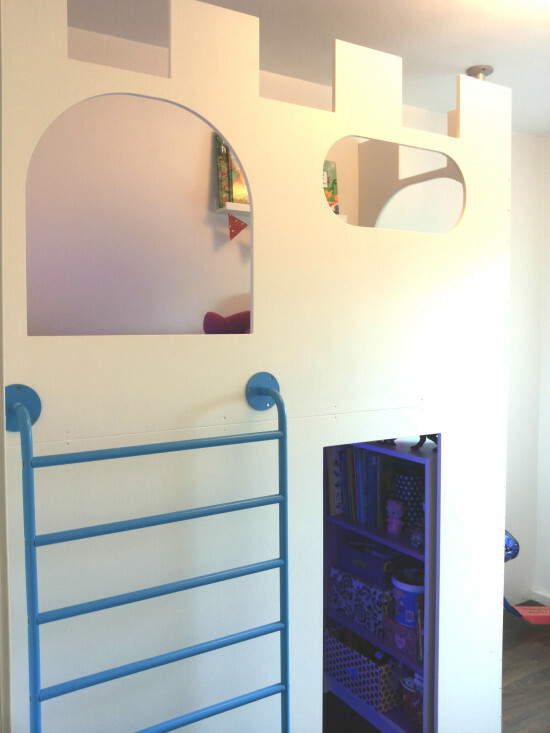 Here castle bed ready to be made available to your child. The child, of course, will say thank you for such parental needlework.